Why make plain ol' grilled cheese when you can make Grilled Pepper Jack and Ham Sandwich? Add tomatoes to your grilled pepper Jack & ham for great flavor. Spread bread slices with dressing. Cover 1 of the bread slices with ham, tomatoes and 2% Milk Singles; top with remaining bread slice. Spray skillet or griddle with cooking spray. Cook sandwich on medium heat (350�F) for 3 minutes on each side or until sandwich is golden brown on both sides. 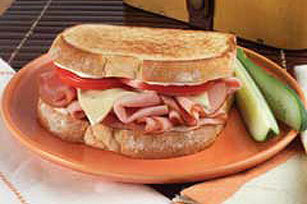 Add GREY POUPON Dijon Mustard to your favorite sandwich for a sophisticated taste. Prepare as directed, using KRAFT 2% Milk Swiss Singles.